The Black Bears come out strong in the second half for a 3-0 victory in the Class C South final. READFIELD — Top-seeded Maranacook set aside a helter-skelter first half and rolled over No. 7 Traip Academy with two goals after the break, sealing a 3-0 win in the Class C South final. 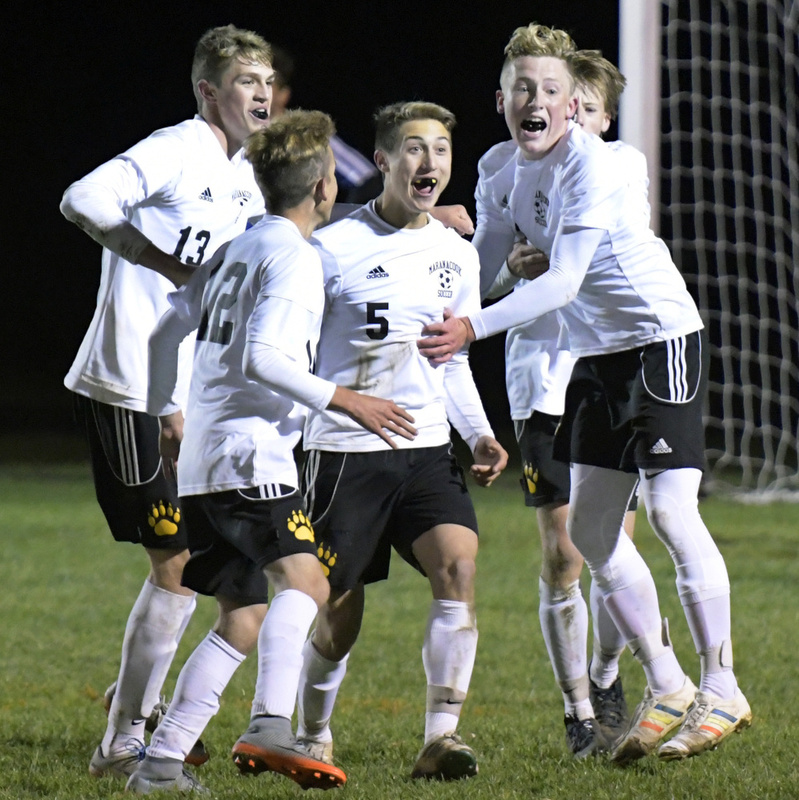 Captains Silas Mohlar and Jackson McPhedran each scored, sending the Black Bears (16-1) to the state championship game at 10 a.m. Saturday at Deering High, where they will face the winner of Thursday’s Class C North final between George Stevens Academy and Fort Kent. Both teams played a nervy game in the opening 40 minutes, most of which was played within 10 yards of the center of the park. The Rangers (11-5-1) tried to settle into the possession game that carried them into the final, while Maranacook was intent on banging the ball around with little coming from it. It all changed in the second half, when a higher Maranacook back line borne out of tighter man-marking created two distinct advantages. The Rangers could no longer pick out the passes that built their attacking game, while greater numbers forward had Maranacook poised as a threat up top. Maranacook’s Jackson McPhedran, center, is congratulated by teammates after his goal in the 67th minute closed the scoring in the victory against Traip Academy. Freshman striker Wyatt Lambert potted the rebound of a Mohlar shot in the 61st minute to give Maranacook a 2-0 lead, and center back McPhedran pushed forward on a deep throw-in to rip home Garrett Whitten’s feed six minutes later. 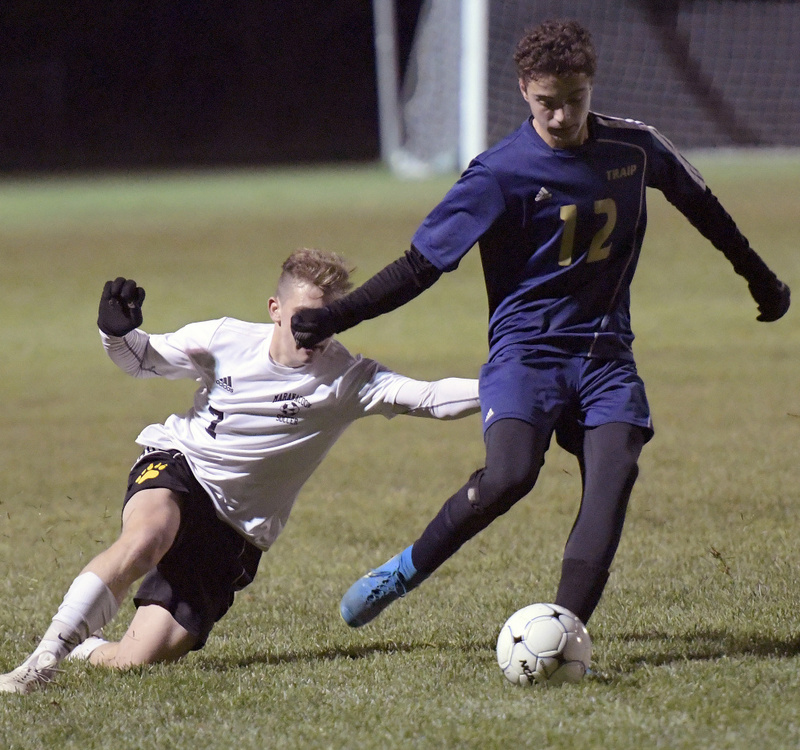 The final 40 minutes were Maranacook’s most complete half of soccer in three postseason games. Maranacook opened the scoring through Mohlar in the 12th minute, when his header off a corner kick went to McPhedran along the goal line. McPhedran collected the ball in space and slid a soft ball to Mohlar, and Mohlar finished from 12 yards out with a low drive to the far corner. Though the rest of the half was largely a stalemate, the Black Bears nearly put it away before halftime. In the 39th minute, junior midfielder Aric Belanger was left unchecked at the top of the 18-yard box, but his curler to the far bar was turned out by a diving save from Traip goalkeeper Jayce Nielsen (four saves). Less than a minute later, Lambert had a strike with Nielsen out of position, only to have his blistering bid cleared off the line by Traip back Jacob Gagner. The near misses set the stage for the second half. In contrast to Saturday’s regional semifinal against Waynflete, when they let the Flyers hang around long enough to force overtime, the Black Bears were in position to finish this one off.